Today was disappointingly another bland day of hiking. We’ve had 4 solid days like this since we hiked out of the Winds and it’s mentally wearing on all three of us. The terrain isn’t difficult, it’s just monotonous and unentertaining, so the days have been going by slowly. 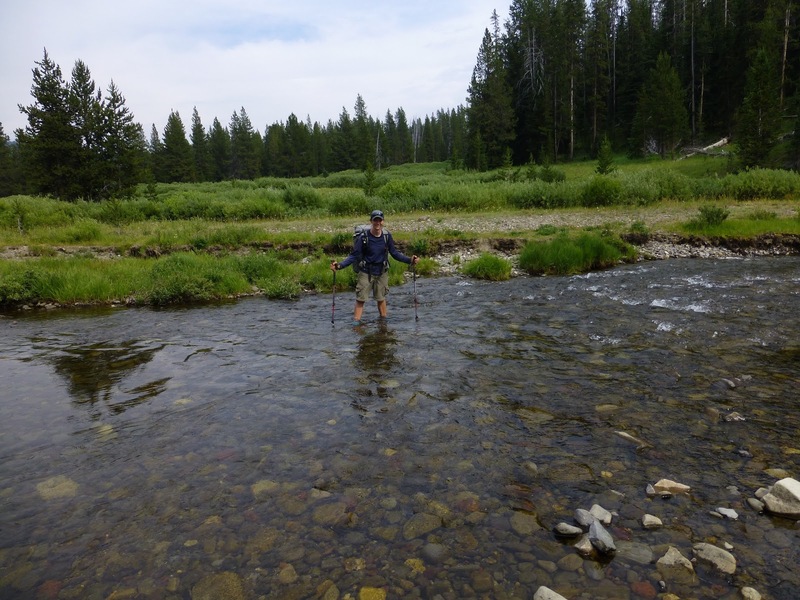 Today we had to do 32.5mi to get to our assigned campsite in the Yellowstone backcountry. I got going at 6:45am and Bloodbath and Rampage were not far behind me. When I started hiking on the trail, I immediately saw grizzly bear footprints heading the same direction as me. They followed the trail for about an hour. They were pretty cool and quite large. 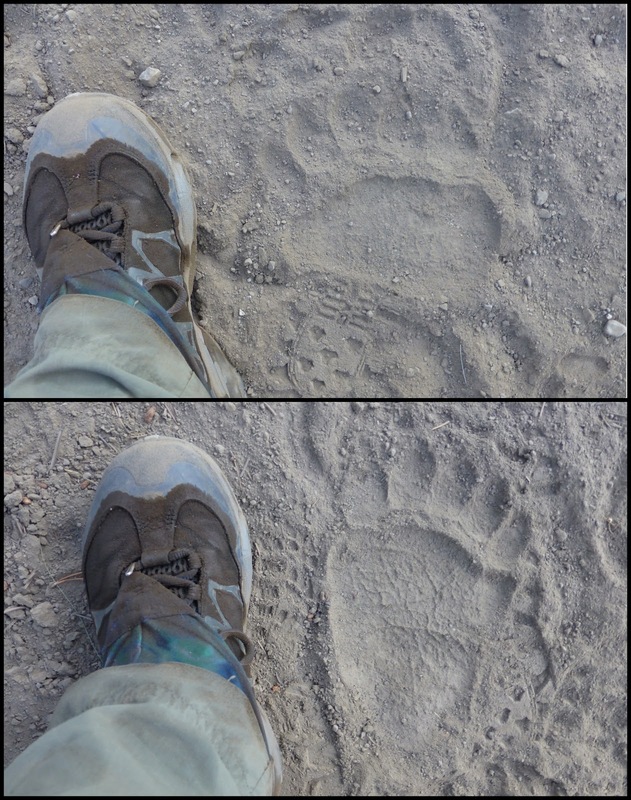 Here are pictures of both the front and back footprints…but no actual grizzly sighting yet. 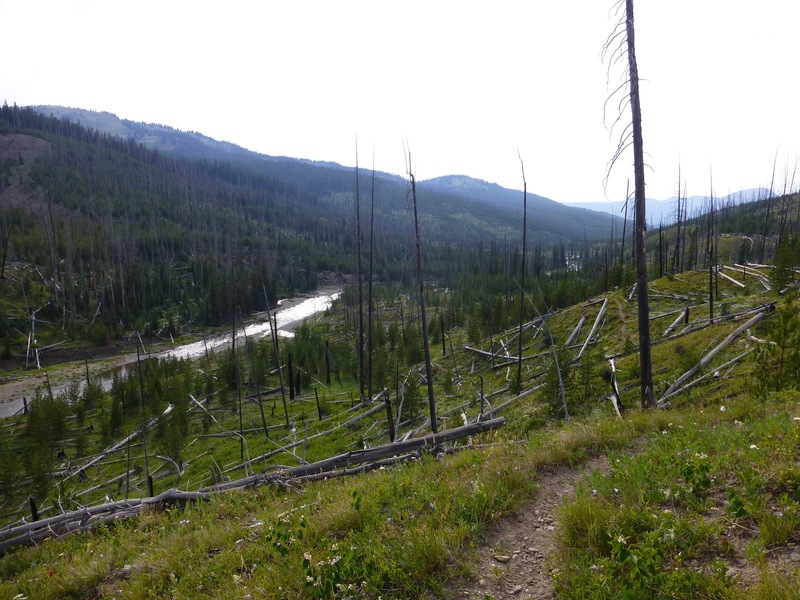 The hiking today went through some shrubby meadows, into burnt or dead woods, and wove up, down, in, and out along the Snake River. Here is the meadow this morning. Then we came to a unique spot called Parting of the Water. 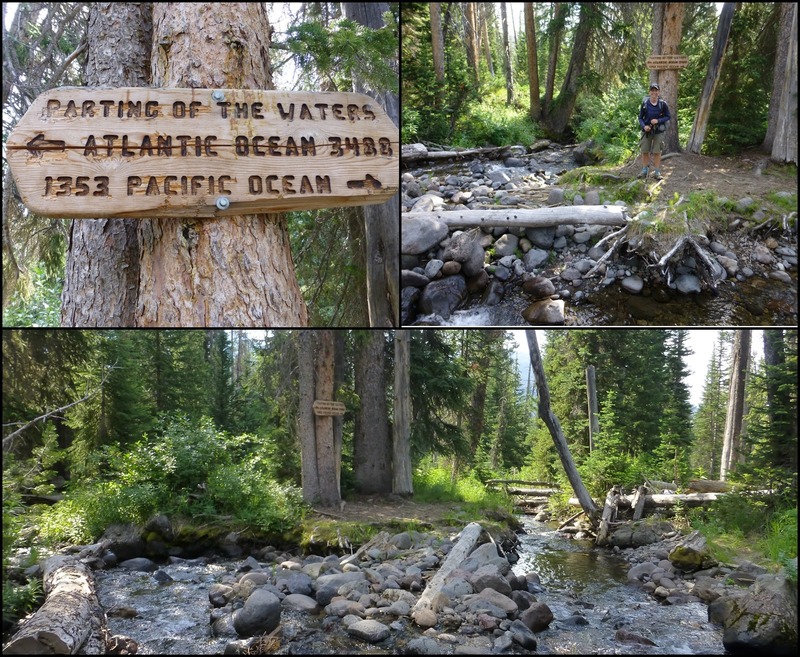 It is a creek called Two Ocean Creek that hits this point where it splits. One fork goes to the Pacific Ocean and the other goes to the Atlantic Ocean. It’s pretty cool. We had one solid climb of over 2,000ft that got us to 10,100ft, but the rest of this leg will stay low in the 7,000 range. We were fortunate that it was overcast today as much of our hiking was without tree cover and it could have been really hot. There were many shallow steam crossings again. I’m trying to remember the last day my feet weren’t wet all day…it had to be in the Basin. It was a long day and we didn’t get to camp until just after 8pm. I had hoped for a cool campsite since this is one of the designated camping areas backpackers are required to use, but it was also disappointing. Lots of shrubs and no view…and not the nice pine needled ground I imagined. Just smashed down dead grass with lots of mosquitoes. I didn’t even take a picture. We again occupied our time with music and an audiobook on the speaker Rampage and Bloodbath have. We started a new audiobook, The Secret Life of Bees…poor Bloodbath is handling it well, ha! I didn’t expect to get through all my audiobooks so quickly, so while we were in town, we loads three that were available on my free public library account. Pickings were slim, but it’s better than nothing. The Secret Life of Bees is average so far as we have just started it. Here is what it looked like the second half of the day as we hiked along the Snake River. Yep, hours of thin burnt trees. It has definitely been more of a mental challenge than a physical one lately. I’ve been thinking of home and non trail life a lot and how I’m looking forward to being done and back in Portland relaxing…laying in bed til noon and watching my TiVo…being clean and eating non trail food…having phone and Internet reception again…seeing the kids/families I nanny and babysit for…going for runs along the riverfront…riding my bike…also, my sister and nephew, and going to see the new baby that will be born any day now….I know this is a lull and I’m really excited for what’s to come in Montana. My brother and nephew are coming to join in for half a day and camp with me in a couple days, so that will be fun and gives me something to look forward to. I just honestly need to vent that the last four days of hiking have not been the most entertaining. 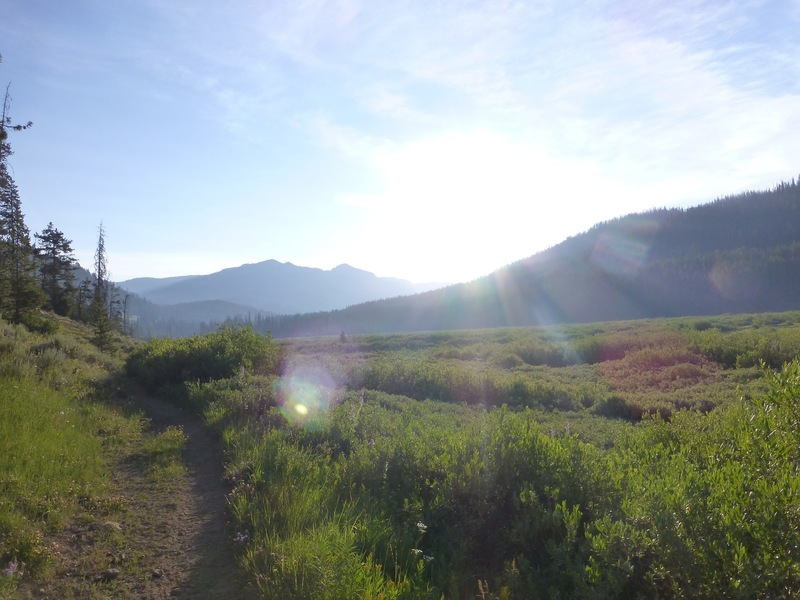 We get even further into Yellowstone tomorrow and our assigned campsite has us doing a more relaxed day at about 26mi, so we decided we’ll sleep in and start hiking at 7:15am. It will be nice to sleep in after how late we’ve gotten to camp the last two nights.